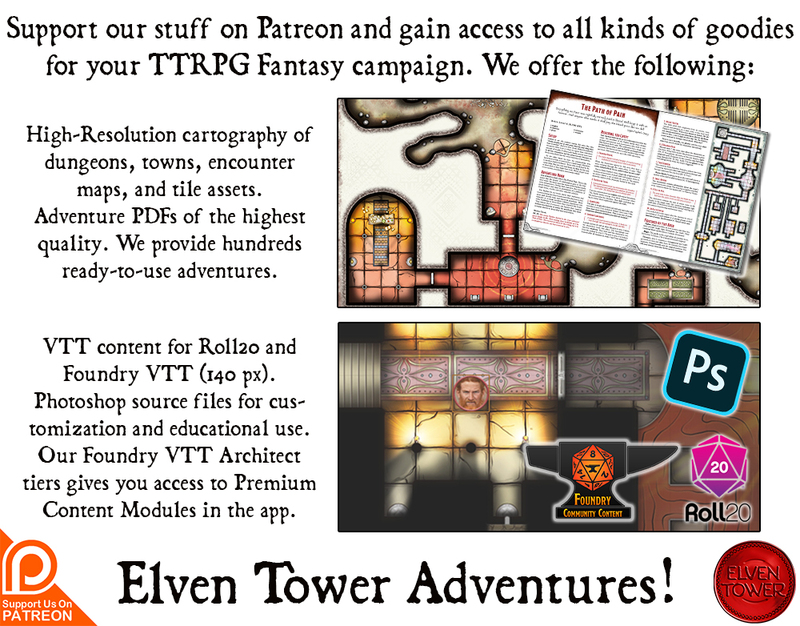 This game aid for RPG tabletop games aims to help DMs with stuff easy to implement or drop in any game, as things are needed. This is an underground vault. It features two levels, the vault is in the deepest level. There are secret doors and traps designed to protect the vault’s location. Light: The first level of the vault complex is permanently illuminated with magical torch sconces with Continual Flame spells on them. A Darkness spell negates the effect of the lights. A Dispel Magic disables the lights in a room for 1 hour. The bottom level is dark. There are magical torch sconces like in the first level but they only activate if the magic word is clearly said; the magic word is “Nigtha”, which means illumination in old Dwarven. Construction: The underground vault is built from a stony cave. Walls are built from 1 ft. blocks of stone. They are plain, except for the pillar stones, which feature intricate bas-reliefs; these portray scenes of armies in battle and valiant knights. The floor is paved with stone tiles. Guardian Statues: There are statues in the form of city guards in the first chamber and the vault door chamber. These statues activate when the pressure plate is pressed. They defend the vault against intruders. They defend themselves if attacked. Welcome Room.- The first chamber in the underground vault complex is a 20ft. square. There are four stone statues. They take the form of guards of the city, each one is holding a spear in their right hand, and a round shield strapped to their back. There are sigils and symbols in their guard armors, but they do not resemble the official uniform of the city guard. Their meaning is either a mystery, or up to the DM to decide. There is a trap in this room that triggers when the pressure plate is stepped on. It requires at least 100 pounds of pressure to activate the trap. Once activated, the four statues animate and attack the intruders. They pursue the PCs only on the first level of the vault and do not exit the complex. A character with a passive perception of 15 is able to see the indentations in the floor that suggest that that part of the floor is movable. If a character wishes to deactivate the pressure plate, a DC 16 Thieves’ Tools check is required. If the character fails to deactivate the trap, there is a 50% chance he triggers the plate by accident. Busts’ Hallway.- After the welcome room, there is a 10 ft. by 35 ft. hallway with wooden double doors at the end. Four pedestals on each side of the hall adorn this place. There are marble busts on each one of the pedestals. The race and appearance of these busts depends on the current adventure, and who owns the vault. The second bust on the northern side hides a button under it that deactivates the pitfall trap for 5 minutes. The double doors that lead to the office are locked. To open the doors, a DC 14 Thieves’ Tools check is needed. There is a pitfall trap in the middle of the hallway. It triggers when the pressure plate is stepped on. It requires at least 50 pounds of pressure for the pressure plate to open to the shaft below. A character with a passive perception of 15 is able to see the indentations in between the floor tiles, apparently they open in the middle. Each creature standing on any of the two marked squares must make a DC 15 Dexterity Save to avoid falling down the shaft to the jail in the bottom level in the complex. The shaft is 56 ft. long but it has a 45 degrees slant, it only goes down 40 ft. to the bottom level. Due to the slanted shaft, creatures falling through it only take 2d6 damage. The trap resets automatically after 1 minute. Office.- There is a desk, a cupboard, a small round table and a bookcase in this room. Account books and tab-lists are on the desk in apparent disarray, a DC 14 Investigation check reveals that the documents are forgeries. One of the desk’s drawers is locked, a DC 13 Thieves’ Tools check opens the drawer to reveal the real balance books. The wooden bookcase is full of accounting and finance titles by experts in those fields. The bottom cabinets in the bookcase are filled with more forged books. There is a book that appears to be out of place, its title is “The adventures of Cinna, the rabbit”. It is a known fable and the only fiction book in the office. If removed from the bookcase, the secret door behind the desk opens. The door hides a back office which features a safe way to reach the bottom floor. To find this book, a DC 13 Investigation check is needed. Gas Room.- Following the flight of stairs down to the bottom level, there is a 15 ft. by 20 ft. room. There is a small round table right near the stairs, and a rectangular wooden table on the southern part of the room. There is nothing of value or important in this room. There is a deadly trap in this room. The marked spot is a pressure plate that triggers several effects. It requires at least 50 pounds of pressure for the pressure plate to trigger the trap mechanism. A character with a passive perception of 15 is able to see the fake stone tile on the marked spot, he also sees a removable stone block on the southern wall, here lies the control panel for the trap. 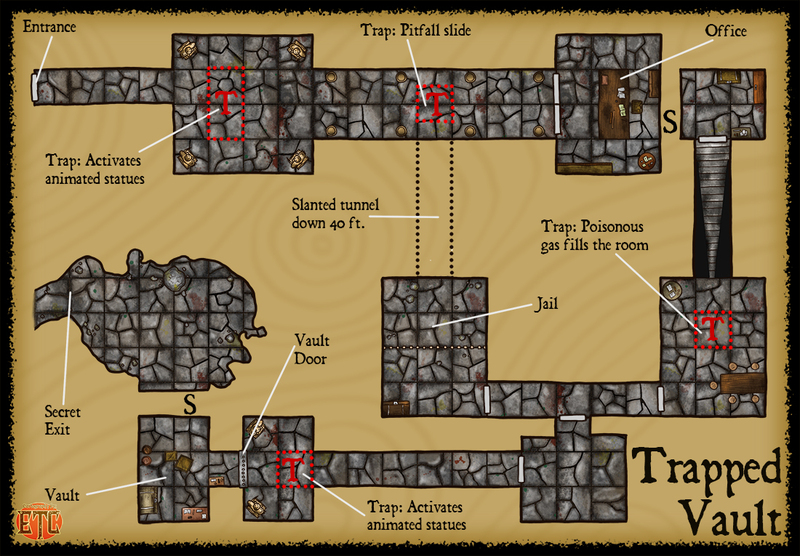 When the trap is triggered, a portcullis falls from the ceiling and blocks the access to the stairs. Poisonous gas starts flowing from hidden holes in the walls and ceiling, filling the room. Each creature inside the room must make a DC 14 Constitution saving throw, taking 10 (3d6) poison damage on a failed save, or half as much damage on a successful one. The effect of the gas is continuous for as long as 5 rounds, saving throws are rolled every round. In order to deactivate the trap, a character must make a DC 16 Thieves’ Tools check to try to turn off the mechanism from the control panel. The portcullis can be lifted with a successful DC 17 Strength (Athletics) check. The south door is locked a character must make a DC 16 Thieves’ Tools check to bypass the complex lock. That same door can be stormed through with a successful DC 16 Strength (Athletics) check. The Jail.- This rooms serves as a prison for any intruders who fall down the shaft in the main level of the complex. There is nothing except some rocks inside the cell, the bars are made from reinforced iron. The barred door has a complex lock. A character must make a DC 15 Thieves’ Tool to open the lock. A character can also make a DC 17 Strength (Athletics) check to bend the bars wide enough to exit the cell. The chest in the room is filled with personal possessions of previous prisoners. The Vault.- The vault door is guarded by two stone statues flanking it. The vault door is round and made of an iron-adamantine alloy. There are many levers and knobs on the vault door. If manipulated in a specific combination pattern, the vault door opens. The specific combination is a complex pattern of level moves and knob turns. Obtaining the combination could be a quest on itself prior to visiting this vault. If the party already has knowledge of this combination, opening the door requires a DC 12 Dexterity check to do so correctly. By careful investigation of the door with Thieves’ Tools, a character can deduce the combination. This process is slow, it takes 1d4 hours and a DC 19 Investigation Check. If either check fails, the statues trap is triggered. The trap is also triggered by pressing the plate located in the marked spot on the map. This trap functions exactly like the one in the welcome room, except that it only animates the two statues present. These statues pursue any intruders only in the bottom level of the vault. Behind the vault door, a small chamber holds whatever treasure or information the party was looking for. The room is also filled with some other things or commercial values, such as art objects, packs of silk and spices, foreign coinage and high-end weaponry or wines. Each character with a passive perception of 16 will notice a fake brick in the north wall. If pressed, a part of the wall recedes and reveals a hidden passage. It leads to a secret exit through a cave complex that either goes back to the surface or deeper into the underdark. This is perfect as a mean to escape the vault. It can also serve to connect the owner of the vault to any kind of dark being from the underdark. Dealings with the drow? Secret alliances with aberrations? Slave trade with the duergar? The background lore for this location is up to you. Whoever owns this vault must be hiding a terrible secret or something of great value. Why the party is storming this vault is also left to the imagination.